Saturday May 8th 1920 A busy day. Hattie had [Monte?] Moorehead here painting screens and in the afternoon Mr Williams came to paint the kitchen. I cleaned my room and put things to rights in wardrobe. I swept the back part of the house and did many other things. The girls were to town in afternoon. Ott & Fannie here in evening. Sunday May 9th 1920 Hatties birthday. Cora prepared a nice dinner. She went to church. It is Mothers day. Otts folks were here for dinner. Rob had to go to the store. William took the rest of us for a ride out to Homestead. Hattie to town in the evening. I read some. Weather quite pleasant. 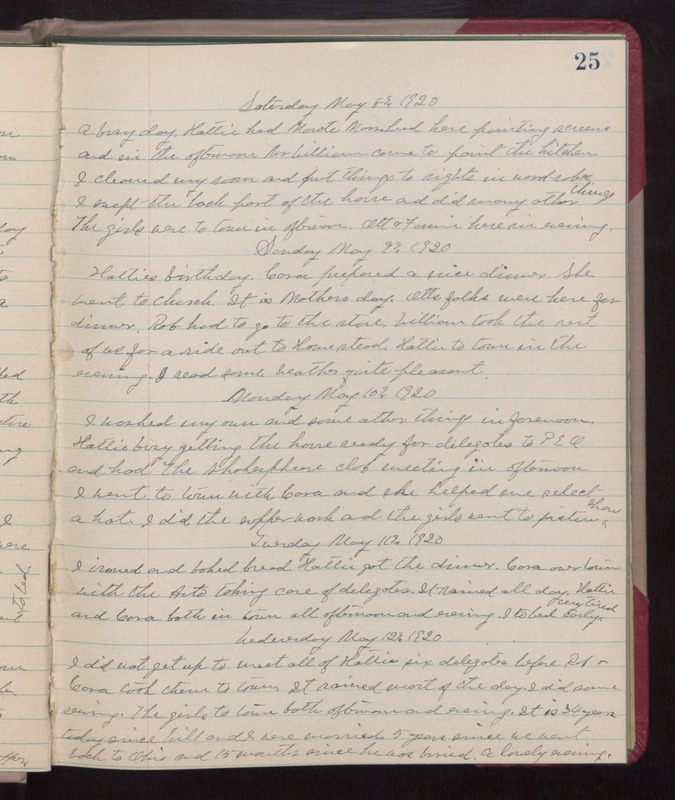 Monday May 10th 1920 I washed my own and some other things in forenoon. Hatties busy getting the house ready for delegates to P. E. O. and had The Shakespeare club meeting in afternoon. I went to town with Cora and she helped me select a hat. I did the supper and the girls went to picture show. Tuesday May 11th 1920 I ironed and baked bread. Hattie got the dinner. Cora over town with the Auto taking care of delegates. It rained all day. Hattie and Cora both in town all afternoon and evening. I to bed early, very tired. Wednesday May 12th 1920 I did not get up to meet all of Hatties six delegates before Rob & Cor took them to town. It rained most of the day. I did some sewing. The girls to town both afternoon and evening. It is 34 years today since Will and I were married, 5 years since we went back to Ohio and 15 months since he was buried. A lonely evening.